Preparing electric Christmas lights each year is a great opportunity to start parent-child bonding and a family tradition. Electric Christmas lights need to be unrolled, detangled, and tested for illuminated light bulbs. This provides a wonderful opportunity for a parent to show a child how to be careful in handling electric wires and cautious in untangling delicate light bulbs. As exemplified in the 1989 movie, National Lampoon’s Christmas Vacation, Clark Griswold asked his son, Rusty, to help him prepare the electric Christmas lights for the annual outdoor holiday decorating. The electric Christmas lights are wound in a tight ball with mini-light bulbs jutting out in all directions. Rusty is assigned the fun task of unrolling and detangling these tightly bound balls of electric Christmas lights. Clark also tells Rusty to test each and every electric Christmas light bulb. This, invariably should take hours, but Rusty manages to accomplish his task in record time. The electric Christmas lights are prepared and hung within a few hours. What a great example Clark makes to other parents who want to spend quality time with their children. Hanging and securing outdoor string lights must be a cautious task. Always use special care when working with electrical wires, including outdoor string lights. Clark Griswold needed to be more careful in securing the outdoor string lights to the roof and eaves of his house. He needed help with steadying the ladder to secure himself against the two-story home so he could carefully staple the outdoor string lights to the roof’s eaves. When he lost his balance, he lost control of the outdoor string lights, grabbed onto the gutters and ripped part of them off the house. This caused a long sharp and pointed icicle to go flying from the gutters of his home right through the window of his next-door neighbor’s house. Up on the rooftop, he strung an abundance of parallel outdoor string lights in rows covering its entire surface. He also accidentally stapled the wrist cuff of his jacket to the roof and pulled up many outdoor string lights in the process of tearing his coat. Perhaps Clark should have asked a family member for help with this project. There are hanging clips available today that are a much better option than stapling when hanging outdoor string lights. Another tradition families can participate in each year is yard lighting and decorating. 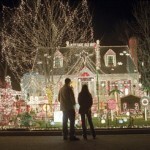 Yard lighting and novelty Eobjects can create a festive mood during the holiday season. Clark Griswold placed Santa’s sleigh and reindeer in the front yard of his house that, unfortunately, went flying high into the sky when there was a nearby chemical explosion. It wound up being a magical moment for all to see. These objects went from being illuminated with yard lighting to being lit by the moonlight. Yard lighting creates a fantastic compliment to home lighting and both provide a cheerful holiday atmosphere. Home and yard lighting are a wonderful way to bond with family members and carry on family traditions. When Clark’s father, Clark Wilhelm Griswold, Sr., complimented him on his wonderful decorations and yard lighting, Clark thanked his father for teaching him everything he knew. Outdoor Christmas lights used for home and yard lighting are a fun, joyful way to spend quality time with our loved ones and carry on family traditions.